Existence and cause of thyroid stunning was controversially discussed for decades but the underlying mechanism remains unclear. Numerous studies describe thyroid stunning in radioiodine-131 therapy (RIT) of differentiated thyroid carcinoma. 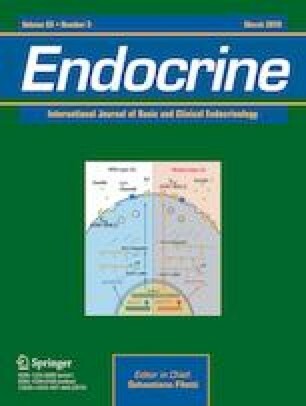 However, there are no studies evaluating thyroid stunning in benign thyroid diseases caused by the radioiodine uptake test (RIUT). Therefore, the influence of pre-therapeutic tracer radiation dose on therapeutic iodine-131 uptake was evaluated retrospectively. A total of 914 RIT patients were included. Exclusion criteria were anti-thyroid drugs, pre- and/or intra-therapeutic effective half-lives (EHL) beyond 8.04 days and externally performed RIUT or 24 h RIUT. All patients received RIUT 1 week before RIT. Thyroid volume was estimated via ultrasound. Tracer radiation dose to the thyroid was calculated retrospectively. The dependence of changes in the pre-therapeutic to the therapeutic extrapolated-maximum-131I-uptake (EMU) from the dose in RIUT was evaluated statistically. EMU in RIUT ranged from 0.10 to 0.82 (median: 0.35) and EMU in RIT ranged from 0.10 to 0.74 (median: 0.33). Averaged over the whole cohort the therapeutic EMU decreased significantly (2.3% per Gray intra-thyroidal tracer radiation dose). A disease-specific evaluation showed dose-dependent thyroid stunning from 1.2% per Gray in solitary toxic nodules (n = 327) to 21% per Gray in goiters (n = 135) which was significant for the subgroups of disseminated autonomies (n = 114), multifocal autonomies (n = 178) and goiters (p < 0.05) but not for Graves’ diseases (n = 160) and solitary toxic nodules (p > 0.05). The presented data indicate for the first time a significant dependence of pre-therapeutic radiation dose on thyroid stunning in goiter and disseminated and multifocal autonomy. To achieve the desired intra-thyroidal radiation dose, RIT activity should be adapted depending on the dose in RIUT. Informed consent was obtained from all individual participants included in the study. This article does not contain any studies with animals performed by any of the authors.